As much as we prompt our children to say ‘please’ and ‘thank you’, teaching kids the real meaning of gratitude and appreciation can be tricky, particularly when we live in a day and age where instant gratification has become the norm. We can order toys, clothes, books, movies, songs, and TV shows at the click of a button, and most kids have unrestricted access to iPads and smartphones. And while I’m the first to admit I use materialistic things to bribe my daughter, I feel like a lot of us spend more time trying to placate our kids than we do teaching them how to be grateful. When I was growing up, we only ever got new toys, books, and clothes at Christmas and on our birthdays. I’m serious. We rarely, if ever, were gifted anything in-between those 2 annual milestones, and on the rare occasion that someone did surprise us with a doll, CD, computer game, or piece of clothing, you’d hear us yelling, ‘thank you!’ for the rest of the day. Did this lack of gift-getting make me feel envious of my peers? But it also made me appreciate things more, and when it was time for me to branch out on my own, I was much better at scrimping and saving and buying things within my budget than my friends. Of course, hindsight is always 20/20, and as easy as it is to get on my soapbox and preach about the importance of teaching gratitude and appreciation to our children, the truth is that I’m just as guilty as the next mom when it comes to showering my child with toys in an effort to give her more than I had when I was growing up. But now that she’s in full-time school and I’m exposed to children from different ends of the spectrum – the Haves and Have Nots, if you will – I realize that giving her everything she wants doesn’t make me a good mom. Teaching her gratitude and appreciation does. So I’ve been thinking, and implementing, and we’re slowly chipping away at what it means to be grateful. Here are 7 ways to teach your child gratitude and appreciation at home. One of the best ways to get our kids to behave in a certain way is to model those behaviors ourselves. Incorporate gratitude into your daily routine by expressing the things you’re grateful for. By focusing on the good instead of the bad, you will reach your child to appreciate the little things in life, and when you express appreciation for the good qualities in your child, you will give her self-esteem a pretty awesome boost to boot! ‘When I was in a dark period, I instituted a simple rule that changed my life. When we actively share the things we’re grateful for on even our most challenging days, we will teach our children to look for silver linings and find ways to feel appreciative no matter what troubles they face. My husband hates Valentine’s Day. He thinks it puts unrealistic expectations on people, and feels love and romance shouldn’t be forced. And while his distain for February 14th initially upset my romantic self, I have to admit his way is better. I have gladly traded the overly priced roses and tacky jewelry I received from the boyfriends of my past for the genuine things my husband does for me throughout the year – the unprecedented compliments and words of appreciation, the unexpected ‘just because’ gifts, and they way he shows me how much he loves me every single day. Why am I telling you this? Because I truly believe that once we stop letting our children live in a world filled with expectation, they will be much more appreciative of all the good the world has to offer. While helping out in soup kitchens and shelters during the holidays offers a great way to teach our children not only how to help others, but also to appreciate all they have, limiting such acts of kindness to one or two days doesn’t always send the right message. Yes, we want to help those less fortunate on Thanksgiving and Christmas, but what about the other 363 days of the year? Encourage your child to help an elderly neighbor, volunteer at a local charity, donate toys and books to children who are less fortunate…you get the idea. Another great way to teach your child gratitude is to have her write personalized ‘thank you’ cards every time she receives a gift or someone does something nice for her. It’s such a small gesture, but when we take the time to write a personalized message each time someone is kind to us, it reminds us to be grateful. In my quest to teach myself how to be a happy and positive person at the beginning of the year, I purchased The Five-Minute Journal. The idea is pretty simple – you set aside 5 minutes in the morning to set the tone for your day (‘What would make today great?’) and another 5 minutes in the evening to remember to count your blessings (‘3 amazing things that happened today are…’), and over time you train your brain to start and end each day with feelings of gratitude so you can learn how to be a happy and positive person. It has been a complete game-changer for me, and I encourage everyone – kids included! – to hop on the bandwagon towards a happier, more positive existence. Order your Five-Minute Journal here! Teach through play with these gratitude activities! One of my favorite parts about being a parent is finding ways to teach my daughter through play. I love how easy it is to teach important lifelong concepts to her without her even realizing it, and the internet is FULL of simple yet effective gratitude activities for kids that teach the art of being grateful. Here are 17 of my faves! Dan Beuttner once said, ‘Gratitude always comes into play; research shows that people are happier if they are grateful for the positive things in their lives, rather than worrying about what might be missing’, and if that doesn’t motivate you to teach your child gratitude, I don’t know what will! 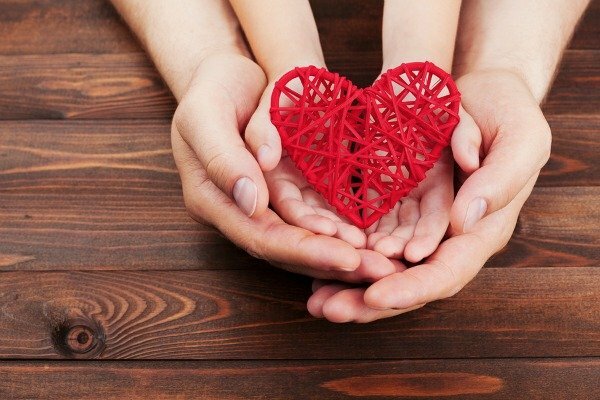 By being a positive role model, focusing on the good instead of the bad, helping others, and continuously engaging our children in gratitude activities, we can teach them to find the good in the world and appreciate all life has to offer. 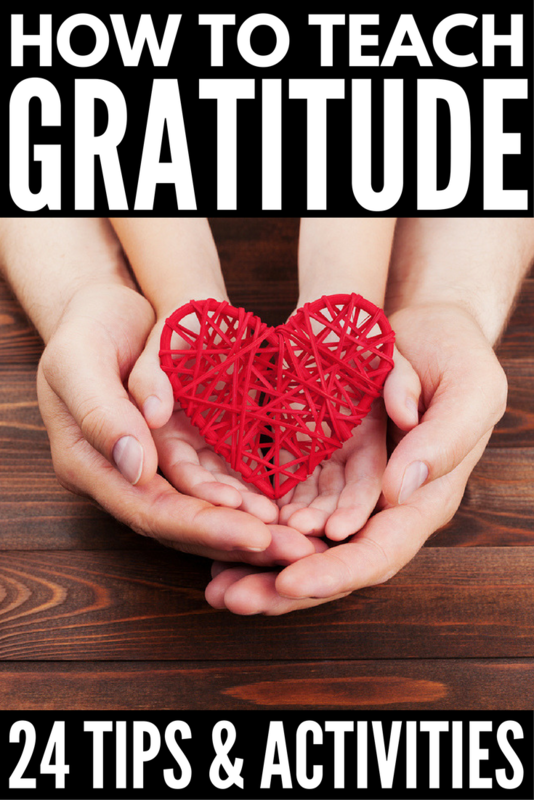 If you found this collection of tips to teach you how to teach your child gratitude as well as the gratitude activities for kids we shared helpful, please share this post on Pinterest!